Details of the Hat Creek Observatory's server room, also called the Signal Processing Room (SPR), at the Allen Telescope Array. 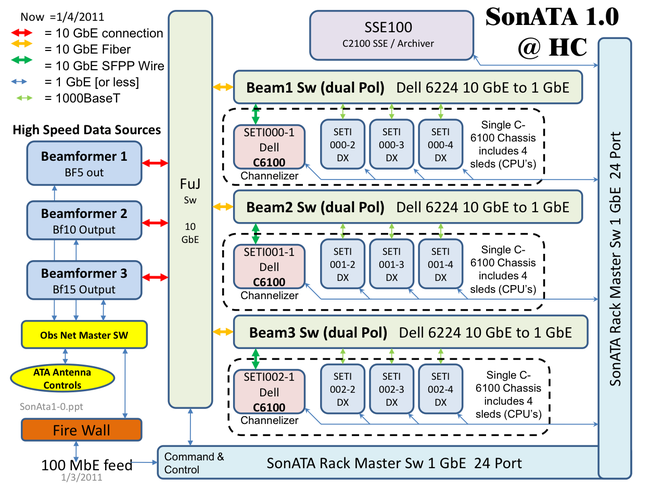 The SonATA system runs on a cluster of 10 GbE Ethernet switches and general purpose computers. Multicast UDP packets are a network data bus that moves data into, throughout, and out of the SonATA system. Total power consumption of the SPR is roughly 60 kW. 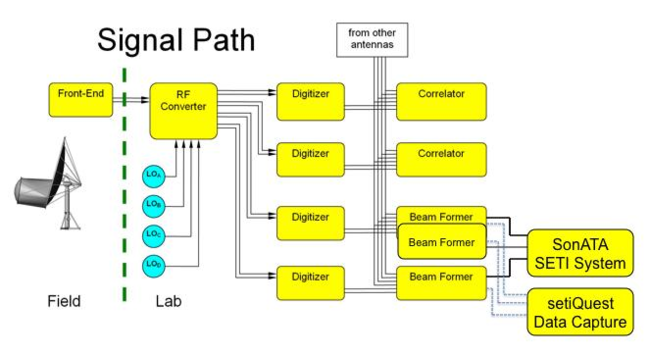 The following ATA signal path diagram shows how the signal flows from the antenna front-end through the different signal processing components to the SonATA system and to the setiQuest Data collection system. The correlators are used for radio astronomy imaging and for system calibration. The following hardware is installed in the Hat Creek server room. RF converter cards Optical analog RF signal in. Frequency range 0.5 to 11 GHz is down converted to a 104.8576 MHz bandwidth and then sampled by ADCs (Analog to Digital Converters). beamformer FPGA cards build multiple phased beams from the down converted digital IF streams. The following flow diagram describes how the different SETI hardware processing components are wired together via Ethernet. A mix of 100MbE, 1GbE, and 10GbE speeds are used. There is one PowerEdge C6100 dedicated to each beam. The beamformer data is received on sled 1 via 10GbE. There are 2 channelizers running on sled 1, one for each polarization, producing 49 800KHz channels. The channels are sent to the other 3 sleds of the C6100 via the 10GbE connection on the switch. The DXs perform sub-channelization and signal detection on the channels. There are 8 DX processes per sled receiving their input via 1GbE. A total of 20MHz is currently being processed. The control system and Archiver run on a PowerEdge C2100. The PowerEdge C6100's have the total processing power of 720 Xeon CPU cores running at 2.66 GHz with 2.88 TB of RAM. Only 3 of the 15 PowerEdge C6100's are currently installed due to issues with power, air conditioning, and network throughput. The PowerEdge rack servers were a joint donation from Dell and Intel. Previously, Hat Creek's Internet pipe was a 40 Mbps symmetrical line that was shared with UC Berkeley. In December 2011 the speed was reduced to 3 Mbps for cost reasons. This reduction will severely limit the amount of scientific data exported for external processing. There are plans to upgrade to a faster pipe in early 2012. There are rumors of the existence of substantial dark fiber running to Hat Creek. This dark fiber could connect the ATA directly to the AWS EC2 cloud using Amazon's Direct Connect service.